Legalism is when you start with something good, but you take it to such an extreme you turn it into something bad. Now by saying "bad" we don't mean "evil." The Sabbath Day was never "evil," but over and over Jesus had to correct the Pharisees about taking the Sabbath to extremes. He once told them that, "Man was not made for the Sabbath...Sabbath was made for man." The Apostle Paul had the same battle (legalism) but his war was against the Christian Judaizers who had made the same mistakes with the ritual of circumcision. Observing these rituals won't save you. As a matter of fact, according to Gal 5:4 they may even COST you your salvation. Pauls said, "You who are trying to be justified by the law have been alienated from Christ; you have fallen away from grace." So whether it's the Sabbath, circumcision, baptism, communion, tithing or any other ritual...they won't save you. The Sabbath pointed to Creation. Circumcision and baptism pointed to the death of the flesh. The function of a ritual is to point you to a reality. If all you ever achieve is the ritual itself, you have missed the point. Ephesians 2:8&9 says that we are saved by Grace through Faith. It's that plain and simple. Now should we get baptized? Of course! I don't know of a single Christian who is NOT baptized. But the Church of Christ denomination says you have to realize that it remits your sins or God will send you to Hell for all eternity. That, my friend, is legalism. I implore those who are trusting in baptism to save you, to go back to what the baptism pointed to: Jesus! Without faith in Jesus, baptism is just a bath. So thank God that you heard, believed, repented, confessed and were baptized, but never trust in any works to save you. It's the blood that saves, not the water. The best examples of legalism in the New Testament were the Pharisees. They made sure they tithed their mint and cumin spices (“Nine seeds for me, one seed for God”) but Jesus said they missed the more important issues like love and justice. The legalist always strains at gnats and swallows camels. Paul warned in II Cor 3:6, "He has made us competent as ministers of a new covenant —not of the letter but of the Spirit; for the letter kills, but the Spirit gives life." So it's better to simply walk in the Spirit than to attempt to adhere to some rigid, legalistic list of do's and don'ts. Does that mean we do not attempt to be obedient to God's Word? Of course not! But what it does mean is, if we will walk in His Spirit, we can also walk in His Peace and Joy rather than fear of condemnation. The New Covenant is one of Grace and Mercy not Do's and Don'ts. So serve God because you love Him rather than in fear of condemnation for there is no condemnation for those who are in Christ (Romans 8:1). Paul probably summed it up the best in Galatians 5:1, "It is for freedom that Christ has set us free. Stand firm, then, and do not let yourselves be burdened again by a yoke of slavery." Most people outside of the Church of Christ denomination are not aware of the extremely legalistic Church of Christ denomination position on marriage. They teach: if you were married but your spouse runs off with another man or woman (and years later you remarry) they insist that in order for you to become a member of their denomination, you must divorce your current spouse and track down your first spouse and remarry her. If she refuses to remarry you, you then must remain single for the rest of your life! 2) Divorce his second wife (of 45 years) and repent for remarrying. Never mind the fact that they had three children. Never mind the fact that the man wasn't even a believer when he remarried. Never mind... anything. Just do it! And the senile old man, infused with fear and doubt, divorced his wife of 45 years. When he died, she was left penniless and brokenhearted. The Church of Christ denomination preacher, on the other hand, walked away with his head high (and nose in the air) "knowing" he just saved that man's soul. Many people outside of the Church of Christ denomination are shocked to hear the convoluted "logic" in this hyper-legalistic perspective. 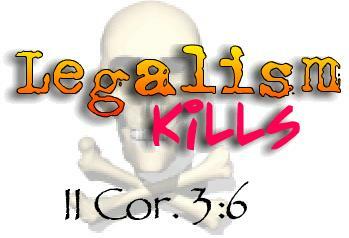 Remember, LEGALISM KILLS (II Corinthians 3:6)! It's a cancer than knows no bounds. You start out with a legalistic approach to any spiritual issue and eventually everything you do is out of fear. You develop a "better safe - than sorry" perspective on life. You start thinking that God is out to get you. He is watching you, just waiting for you to step out of line so He can squash you like a bug! Perfection ceases to be just a goal, it instead becomes a mandate. "If I want God to love me, I MUST be perfect." Sounds an awful lot like Mormonism. Which should not come as a surprise, because legalism is the main ingredient in every cultic organization. "It's my way, or the highway (to hell)." Most believers are willing to tolerate a certain level of legalism. Some folks would say that I am legalistic about a few things. Each person has to determine where to draw the line. Some Christians say that you should be in church every time the doors are open, "At least Sunday morning and Sunday and Wednesday night!" If the Scriptures stated that as a standard, then I would agree. But cultural norms and human traditions should not be elevated to the same level of authority as the Bible. Jesus was speaking to the Pharisees when He said that. They were the legalists of His day. I would venture to say that He would say the same thing to the Church of Christ denomination: "You nullify the word of God for the sake of your tradition."